When I saw this movie, I experienced a similar phenomena as when I saw Good Night, and Good Luck last year: my movie-going companion Brandy and I were by far the youngest people in the theater. This movie is about a real radio program that I had never heard of before a movie was made about it. I imagine the radio program was liked by an older crowd than my contemporaries. Despite the inclusion of Lindsay Lohan in the cast, this film isn't really aimed at my demographic. It matters not. This is my favorite film so far this year (a year that has admittedly been rather poor in terms of movies). It is simply masteful, hitting almost every one of the emotions that come with feelings of nostalgia: there are real tears of loss and real tears of joy and some absolutely gutbusting laughs. The movie doesn't really have a story per se. It is simply about all of the events that happen during the final broadcast of the eponymous radio program, both backstage and onstage. Centering the film is Garisson Keillor as a version of himself (the character's name in the credits is simply "GK"). GK refuses to become sentimental about the final broadcast and insists on simply treating it the same as any other show. This non-sentimentality borders at times on an almost militant philosophy; when a regular performer dies, GK refuses to even mention it on the air. When he is called heartless and asked if he doesn't want to be remembered, he replies (my favorite line in the film) that he of course wants to be remembered, but he doesn't want people to have to be told to remember him. Because the film keeps coming back to GK's firece level-headedness, the other characters in the film are a little freer to go out on more emotional limbs. But nobody really strays very far. Even when Meryl Streep practically has a breakdown on the stage it is treated almost gently. "Gently" is kind of the catch-word of this movie. Everything is presented with a soft, gentle touch that brings a loving warmth to every corner of the film. Even the climax of the film is simply sweet and gentle: Lindsay Lohan's character, the daughter of one of the regular performers on the show (Streep), gets to sing the final musical number of the night due to the show running short. In a normal movie script she would no doubt belt out a moving, powerful song designed to make the audience watching the film weep. Instead, she sings a funny little country song about a jerk of a boyfriend, and she forgets the words and (after asking the bandleader if he knows them) has to make them up as best she could. As such it turns what in a lesser movie would have been a cheap emotional ploy into simply a sweet moment with a couple of chuckles in it. The big laughs in the movie are provided by Woody Harrelson and John C. Reilly as two cowboy singers who decide to go out with a bang and perform a song called "Bad Jokes," which is just a series of base, vulgar jokes that make the stage manager throw up his his hands in exasperation. Their timing as they try to one-up each other is especially good. I had some problems with Virginia Madsen's character. Her performance seems a little too mannered, almost as if she's in a completely different film than the rest of the cast. Also the other characters in the movie accept her supernaturability a little too easily and are a little bit too blasé about her presence. I also didn't really buy Lilly Tomlin as a country music singing sensation; her voice just didn't work for me. Maybe she was the least talented singer to begin with, and then smoked like a chimney for her entire life? Small quibbles, really. The movie left me glowingly happy, feeling as if I had been listening to this radio program my entire life even though in real life I had never heard of it before. 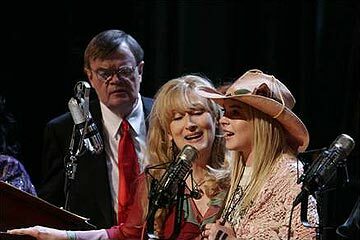 A Prairie Home Companion is a wonderful, delicately balanced film about appreciating everything that has lead up to where you are now without having any expectations of where you're going.